Home » Inaugural Sustainability Showcase a success! Monday, April 1st marked the first day of Earth Month 2019. To celebrate, all week long, Trinity College School hosted the inaugural Sustainability Showcase in the Hawkins Mezzanine of Cirne Hall. 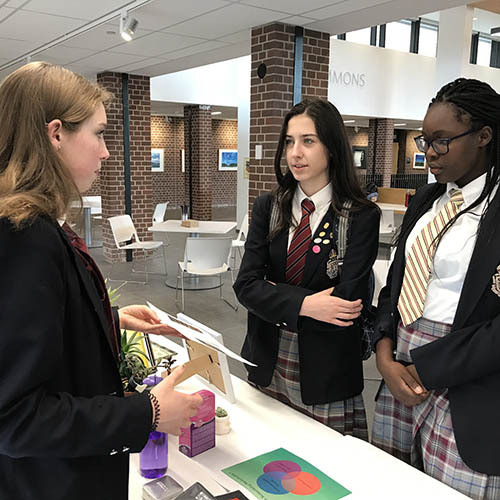 The showcase took place during afternoon flex period each day and featured 12 “Sustainability Superstars” from the TCS community who have made changes to their lifestyles that allow them to be more environmentally friendly. The purpose of the showcase was to share actions we can all take to positively impact our environment. Some actions, for example buying in bulk, call for major lifestyle changes, while others such as using Ecosia, an eco-friendly search engine, require only a simple adjustment. Throughout the week many topics were discussed. Mr. Justin Murphy explained how he transitioned to purchasing his groceries in bulk without packaging to reduce waste. The Trinity Environmental Action Club (TEAC) leaders spoke about a global environment movement called “plogging,” which is a combination of jogging and picking up plastic waste. Carla Brossette shared the effects consumption on our planet and the “Slow Fashion” movement. Ms. Alison Elliott showed off some of the products she uses to reduce her carbon footprint such as dryer balls to reduce drying time and eliminate chemical softeners, and bees wax paper to replace plastic wrap. Lauren Miller, a Ketchum House green rep, explained how to be environmentally friendly while living in a boarding house. Ayo Eyesan presented various actions we can take to reduce our carbon footprint that he researched for a physics project. Mr. Matt Fox and Ms. Steph Feddery discussed the zero waste movement. Finally, on the last day of the showcase, Danielle Thebeau discussed the environmental benefits of veganism, while Dr. Vincenza Pontieri showed off a display that explained how clicking two-day shipping while online shopping negatively impacts the environment. Overall, the showcase was extremely successful. Everyone who came by left feeling inspired to reduce their carbon footprint. Although the showcase may be over, it is never too late to make environmentally friendly lifestyle changes! If you have any questions about the big and small actions that you can take to positively impact our environment reach out to any of the Sustainability Superstars. View the Sustainability Showcase ’19 gallery for more photos.